Today, during the education-focused media event Apple announced iBooks 2, an updated version of its e-book program for iOS devices. This update is a part of Apple’s move into sphere of interactive digital textbooks, performed in cooperation with several major publishers. Apple is cooperating with Pearson, Houghton Mifflin Harcourt and McGraw-Hill, with three companies now responsible for 90 percent of all textbook sales in U.S. Today Pearson and McGraw-Hill are releasing several introductory titles and more titles are coming soon. Apple’s initial focus is on textbooks for high schools, with prices at $14.99 or less. Authors can continuously update their content, and students can keep their books indefinitely. iBooks 2 is available for free download on the App Store. Also Apple released iTunes 10.5.3, which allows users to sync new textbooks with their iPads. 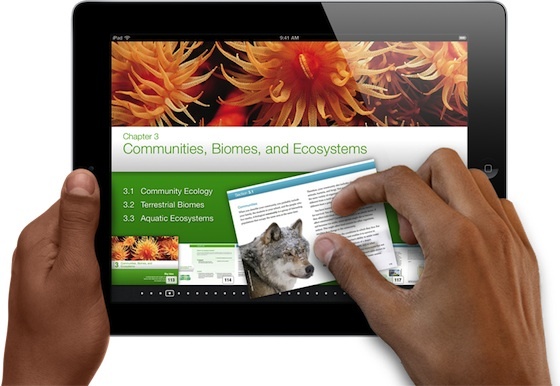 “iTunes 10.5.3 allows you to sync interactive iBooks textbooks to your iPad. These Multi-Touch textbooks are available for purchase from the iTunes Store on your Mac or from the iBookstore included with iBooks 2 on your iPad”.